You don’t have to be big to be great, and it’s places like Moo! that bear testament to this fact. In the most unlikely of sidestreets in Aldgate, this cosy little Argentinian grill has made a serious name for themselves… serving up homemade Empanadas, their signature Lomitos (gourmet sandwiches) and proper Argentine steaks. Despite this being our first time, Jose Luis and team who run this gem of a place managed to make us feel like family from the minute we walked through the door. I’ve never really been sold on Empanadas (till now that is)… and I think that’s purely a result of being deprived of real Empanadas. And the real stuff this is indeed… fragrant, flaky pastry cases, served toasty warm straight from the oven, full of wonderfully gooey fillings from Jamon & Queso (Ham, Cheese & Mozzerella) to the excellent Humita (sweetcorn, red peppers and light bechamel-like sauce). Epic, and quite simply the best Empanadas I’ve ever tasted. 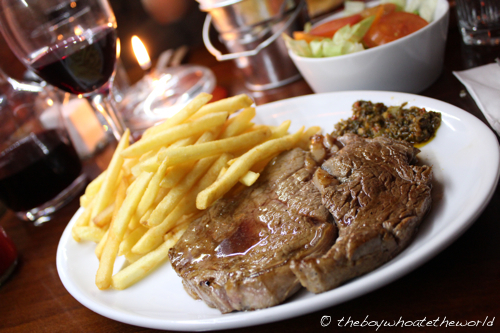 Churrasco steak (thin-cut Rib-eye) with fries was not only amazing value at £9.99, but the meat was grilled on their parrilla to medium-rare perfection… the wonderful marblings of fat throughout melting in the mouth like butter to release bombs of carnivorous flavour. Their homemade Chimichurri sauce (albeit an extra £2) is an absolute must – the earthy oregano-parsley blend and mild heat from the red pepper flakes complemented the simply-seasoned steak beautifully. What was arguably even more satisfying though was their Lomito. 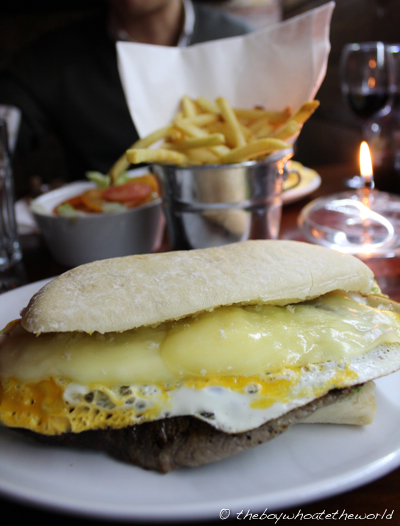 We went for the Potro, a fully loaded sarnie packed so full of Rump steak, ham, melted cheese, salad and fried egg the fillings were quite literally spilling out of the helplessly fluffy white bap it came in. A beast of a sandwich that was crying to be devoured Man vs Food style. To top it all off, Jose Luis’ mom makes some cracking homemade, comfort-food desserts. 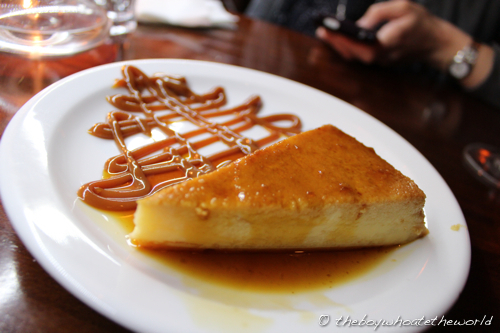 Their Budin de Pan (Caramelised bread budding) was delish… like a firm creme caramel with body, it had a lovely baked-cheesecake-type texture and was served with a healthy swirl of dulce de leche caramel on the side. Yes, it’s an intimate place… I counted 6 tables in total and with barely 15 people seated it already seemed like a full-house. But my oh my is it run with a whole lot heart and warmth. It’s no wonder it’s already attracted a huge City following and a legendary lunchtime queue that often spills over outside onto the pavement. I’ll most certainly be back (probably in the latter part of the evening when they are less rammed) when I’m in need of a bit of medium-rare Moo and a good glass (or three) of Malbec. p.s. 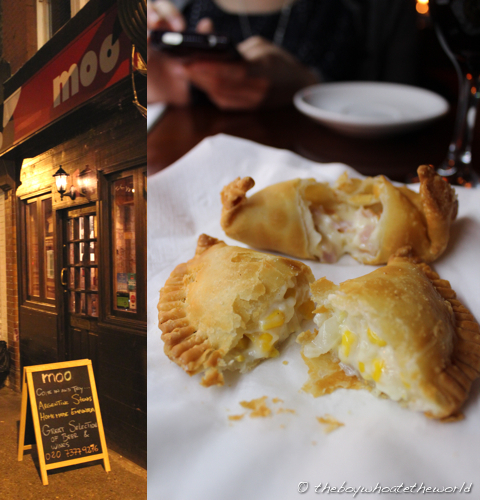 Tx to thelondonfoodie’s Top Latin American Eats in London for the tip on Moo! Very well written and stunning photography, and thank you for the link back to my review! Tx Luiz. It’s you we have to thank for helping us find the place. We live down the road from it and never would have thought there was such a neighbourhood gem in Cobb Strt of all places!